Not to be confused with Hertfordshire. For the UK Parliamentary constituency (abolished 1885), see Herefordshire (UK Parliament constituency). Motto: "Pulchra terra Dei donum"
Herefordshire (/ˈhɛrɪfərdʃər/) is a county in the West Midlands of England, governed by Herefordshire Council. It borders Shropshire to the north, Worcestershire to the east, Gloucestershire to the south-east, and the Welsh counties of Monmouthshire and Powys to the west. 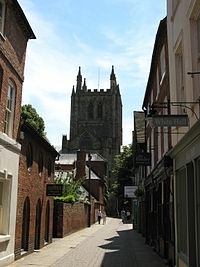 Hereford is a cathedral city and is the county town; with a population of approximately 55,800 inhabitants it is also the largest settlement. Situated in the historic Welsh Marches, Herefordshire is one of the most rural and sparsely populated counties in England, with a population density of 82/km² (212/sq mi), and a 2017 population of 191,000 - the fourth-smallest of any ceremonial county in England. The land use is mostly agricultural and the county is well known for its fruit and cider production, and the Hereford cattle breed. Herefordshire was reconstituted both as a new district (effective 19 July 1996) and as a new county (coextensive with the area of the aforementioned district) (effective 1 April 1998) by Statutory Instrument as defined in The Hereford and Worcester (Structural, Boundary and Electoral Changes) Order 1996. This Order established Herefordshire as a unitary authority on 1 April 1998, combining county and district functions into a single council. Herefordshire is also commonly called a unitary district, but this is not official nomenclature. Herefordshire is officially known as a unitary authority for local government purposes. It is governed by Herefordshire Council which was created in 1998 with the new unitary district that absorbed the previous administrative areas of Leominster District Council, South Herefordshire District Council, Hereford City Council, parts of Hereford-Worcester County Council, and parts of Malvern Hills District Council. The Lieutenancies Act 1997 made Herefordshire a ceremonial county, covering the exact area of the unitary district. For Eurostat purposes it is a NUTS 3 region (code UKG11) and is one of three counties that comprise the "Herefordshire, Worcestershire and Warwickshire" NUTS 2 region. 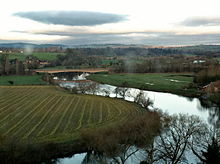 The River Wye, which at 135 miles (217 km) is the fifth-longest in the United Kingdom, enters the county after briefly being its border with Powys. It flows through both Hereford and Ross-on-Wye before returning to Wales. Leominster is situated on the River Lugg, a tributary of the Wye. There are two Areas of Outstanding Natural Beauty in the county. The Wye Valley is located in the river's valleys south of Hereford, while the Malvern Hills are in the east of the county, along its border with Worcestershire. In 1974 it was merged with neighbouring Worcestershire to form the Hereford and Worcester administrative county. Within this, Herefordshire was covered by the local government districts of South Herefordshire, Hereford, and part of Malvern Hills and Leominster districts. However, the county was dissolved in 1998, resulting in the return of Herefordshire and Worcestershire as counties. Herefordshire's growth rate has in recent decades been higher than the national average, with the population increasing by 14.4% between 1991 and 2011 – the population of England as a whole increased by only 10.0%. However this has been from a lower base, with only Northumberland and Cumbria having lower population densities than Herefordshire. The population is White 98.2%, Asian 0.8%, Mixed 0.7%, Black 0.2%, Other 0.1%. Romany Gypsies and Irish Travellers fall within the definition of a minority ethnic group under the Race Relations Amendment Act (2000). They have contributed to the development of the county, for example through seasonal working in orchards. There were approximately 400 people (0.2%) within this minority group in the county at the 2011 Census. The major settlements in the county include Hereford, which is the county town and Herefordshire's only city, as well as the towns of Leominster, Ledbury, Ross-on-Wye, Kington and Bromyard. This is a chart of trend of regional gross value added of Herefordshire at current basic prices published by the Office for National Statistics with figures in millions of British Pounds Sterling. Many well-known cider producers are based in Herefordshire. These include Weston's cider of Much Marcle, and Bulmer's cider, from Hereford, which produces the UK market leader Strongbow. Most employment in Herefordshire is in agriculture, manufacturing and services. According to Herefordshire Council's online document "worklessness", 10% of people are unemployed in Herefordshire including out-of-work, homeless, ill and disabled and their carers. Cargill Meats and H. P. Bulmers are two of the largest private sector employers, with the Council and NHS being the largest public sector employers. There are two parliamentary constituencies in Herefordshire. As of January 2017[update], Bill Wiggin represents North Herefordshire and Jesse Norman represents Hereford and South Herefordshire. Both politicians are members of the Conservative Party. The Council operates a cabinet-style council and is Conservative controlled. The Chairman is Councillor Brian Wilcox and the Leader of the Council is Councillor Jonathan Lester. The Cabinet Leader is appointed yearly by the full council of 53 councillors. The Cabinet Leader then picks their deputy and up to 8 other councillors to form the executive cabinet. Each cabinet member makes the decisions about the portfolio that they are allocated. Elections to the council are held every 4 years. Elections are conducted under the FPTP system with the 53 wards returning 1 councillor each. Elections have been held in 2000, 2003, 2007, 2011, and 2015 with the next election due in 2019. The Herefordshire Youth Council has been running for 4 years; it is chaired by Amy Saunders. Herefordshire has a comprehensive education system that also includes several independent schools. Most state secondary schools are for ages 11–16. Colleges of further and higher education in the county include Hereford College of Arts, Hereford College of Education, Hereford Sixth Form College, Herefordshire and Ludlow College and the Royal National College for the Blind. The agricultural economy has changed greatly in recent years within the county. The county is on the western edge of England which has been historically pastoral as opposed to the east which was more arable. Probably Hereford's most famous export is its Hereford beef cattle. Herefords are docile but extremely hardy creatures and these attributes have led to their proliferation across the world, particularly the USA, South America and Australia. The breed is so gentle that a Hereford bull has been used as the mascot for Hereford United Football Club for many years, led around the club's Edgar Street ground before major matches. The county is famous for its apple and pear orchards, and its cider. There are many orchards around the county but not as many as there once were. In the last few years, soft fruits such as strawberries have become a new and rapidly expanding area of the agricultural economy of the county. One of the main reasons for this was the introduction of the polytunnel or French tunnel. This allows the strawberries to be grown for a far longer season and with a higher quality (with no blemishes from the rain). The strawberries are mainly picked by Eastern European workers who come over for the season and often earn more money, more than they could working in their own country and with the bonus, for many of them, of learning or improving their English. The polytunnels have been a major issue in the county, as some people see them as a "blot on the landscape". Although some polytunnel sites are illegal, Herefordshire Council has turned a blind eye in the belief that agriculture must be allowed to innovate; otherwise it will stagnate and the county will suffer. Previously, most farms in the county had dairy cattle. Due to the cost of investing in new equipment, long hours[clarification needed], BSE, foot-and-mouth disease and mainly falling milk prices, the county's milk production has drastically reduced, with only a few farms still in dairy farming. As mentioned above, the county is historically pastoral. The soils are mostly clay, meaning that large scale potato production was very difficult, as tractors were not powerful enough to pull the large machinery required to harvest the crop. Around the early 1990s new technology and more powerful machines overcame this problem. Potato production started to increase, fuelled by a few other key factors: The previously pastoral soils had not had potatoes grown in them; consequently they were not infected with eelworm (Heterodera rostochiensis and Heterodera pallida), which in the east of England had to be sprayed against weekly (a large cost). Also, the clay soil produced an unblemished potato of the highest grade. The intensive nature of the crop meant that potatoes could be grown viably on a given field in only one of every five years. Because potato growers always needed more land than they owned, they rented extra. This demand for rental fields came at a time when the rest of the industry was struggling and in serious decline. The potato farmers' rents of £300–500 per acre (as opposed to normally £80 per acre) were very helpful to many farmers in a difficult period. Herefordshire County Council was granted a coat of arms on 28 February 1946. The arms became obsolete in 1974 on the abolition of the council, but were transferred to the present Herefordshire Council by Order in Council in 1997. Gules on a fesse wavy between in chief a lion passant guardant argent and in base a Herefordshire bull's head caboshed proper, a bar wavy azure; and for a Crest on a wreath of the colours a demi lion rampant gules holding in the sinister claw a fleece or; and for Supporters, on the dexter side a lion guardant or gorged with a wreath of hops fructed proper and on the sinister a talbot argent gorged with a collar or charged with three apples proper. The red colouring ("gules") of the shield is taken from the arms of the City of Hereford. The red colour also represents the red earth of Herefordshire. The silver and blue wave across the centre of the shield represents the River Wye. The lions that form parts of the arms, crest and supporters are also taken from Hereford's arms. The agricultural produce of Herefordshire is represented by the bull's head, fleece, hops and apples. The talbot dog comes from the heraldry of the Talbot family, Marcher Lords of Shrewsbury and also from that of Viscount Hereford. The Latin motto is: Pulchra terra Dei donum ("This fair land is the gift of God"). As part of a competition organised by the charity Plantlife to raise awareness of conservation issues, the public were asked to vote for "county flowers" that they felt best represented their county. Mistletoe was announced as the winning choice for Herefordshire in 2004. The emblem has no official status and has not been widely adopted. Herefordshire Council uses a logo consisting of a green apple. Perhaps the most famous sporting team in Herefordshire is Hereford United football club, who were members of the Football League and played at Edgar Street stadium in the city of Hereford. The club was founded in 1924 on the merger of two local teams – St Martin's and RAOC – and became members of the Birmingham Combination League. The club then made its way upwards to the Southern Football League, finally gaining election to the Football League in 1972 – the same year that the club famously defeated First Division side Newcastle United in an FA Cup tie. Two successive promotions saw the club reach the Second Division in 1978, but two successive relegations followed and saw the club side back into the Fourth Division. Despite being situated within England, the club has competed in the Welsh Cup on a number of occasions, winning the trophy in 1990. The club suffered relegation from the Football League in 1997 and fell into the Football Conference, not regaining its Football League status until 2006. The club then played in Football League Two – the fourth tier of English football – for six years before once again being relegated out of the Football League at the end of the 2011–12 season. The club was wound up in 2014. A new phoenix club, Hereford F.C. was set up competing in the Midland Football League Premier Division (9th tier) for its first season, 2015–16. The club lost to Morpeth Town at Wembley Stadium on 22 May 2016 in the final of the FA Vase. Cricket is widely played within the county, and Herefordshire County Cricket Club compete in the Minor Counties Championship, having been elected in 1992 to take Durham's place, when that county joined the First-class structure. The leading club sides in Herefordshire are Brockhampton CC and Eastnor CC, who both compete in the Birmingham and District Premier League, the ECB accredited Premier League for cricket clubs in the West Midlands, and one of the strongest cricket leagues in England. Below that in the cricketing pyramid system 7 other leading Herefordshire clubs compete in the Worcestershire County Cricket League, with the remaining 25 or so cricket clubs within the county competing in the Marches League, or just playing Sunday or mid-week 'friendly' matches. The M50 motorway near Ledbury and Ross-on-Wye. 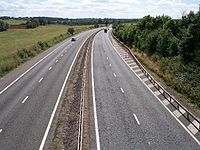 The M50, one of the first motorways to be built in the UK, runs through the south of the county and, with the A40 dual carriageway, forms part of the major route linking South Wales with the West Midlands and the north of England. The A49 runs north–south through the county and is a strategic route between North and South Wales as well as catering for local traffic. The Welsh Marches Railway Line also runs north–south with passenger trains operated by Transport for Wales offering links to Manchester as well as to North and South Wales. Hereford is the western end of the Cotswold Line which runs via Worcester with through services to Oxford and London Paddington (operated by Great Western Railway) and to Birmingham (operated by West Midlands Trains). The rural Heart of Wales Line linking Craven Arms in Shropshire to Llanelli in southwest Wales passes through the extreme north west of Herefordshire with stations at Knighton and Bucknell near the meeting point of the boundaries of Herefordshire, Shropshire and Powys. The majority of passengers between North and South Wales use the Marches line. Former lines which are now closed were Ledbury to Gloucester; Hereford to Ross-on-Wye and onward to Gloucester and Monmouth; Hereford to Hay-on-Wye; Pontrilas to Hay-on-Wye; Hay-on-Wye to Brecon; Leominster to New Radnor; Eardisley to Presteigne; and Leominster to Worcester via Bromyard. Part of the Titley Spur is opened annually by enthusiasts and a steam train is run along the track. There has long been talk of a new station at Rotherwas, in the south of Hereford. Arriva Trains Wales service passing the currently closed Pontrilas station on the Welsh Marches Line. There are no airports with Scheduled air transport in Herefordshire. Birmingham Airport, Cardiff Airport, and Bristol Airport are the nearest. The RailAir coach operated by First Great Western provides connections to London Heathrow via Reading station or passengers can change at Reading station and then go all the way by train via Hayes & Harlington to Heathrow Airport. Shobdon Aerodrome near Leominster is a centre for general aviation and gliding. Hot air ballooning is also popular with Eastnor Castle being one of the favourite launch sites in the area. Historically, the rivers Wye, Teme and Lugg were navigable but the wide seasonal variations in water levels mean that few craft larger than canoes and coracles are now used. There are canoe centres at The Boat House, Glasbury-on-Wye (in Powys, Wales), the Hereford Youth Service and Kerne Bridge in Ross-on-Wye, as well as rowing clubs in Hereford and Ross-on-Wye. The early 19th century saw the construction of two canals, The Herefordshire and Gloucestershire Canal and The Leominster & Stourport Canal but these were never successful and there are now few remains to be seen. The Herefordshire and Gloucestershire Canal is currently the subject a restoration project, which includes the construction of a new canal basin in Hereford city centre as part of the regeneration of the Edgar Street Grid. The project, however, is being undertaken by a small voluntary group and there is no expected date for any part of the canal to re-open for boating. Classical composer Sir Edward Elgar lived in Hereford from 1904 to 1911. His association with the city is commemorated with this statue. 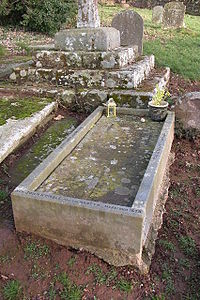 Roman Catholic martyr St. John Kemble's grave in the Herefordshire village of Welsh Newton. ^ "''The Hereford and Worcester (Structural, Boundary and Electoral Changes) Order 1996''". Opsi.gov.uk. 16 July 2010. Retrieved 25 September 2010. ^ Official Hereford Council website. Retrieved 21 May 2009. ^ "NUTS (Nomenclature of Territorial Units for Statistics), by regional level, version 2013" (zip). Eurostat. Retrieved 11 January 2015. ^ "Top Ten Longest Rivers in the United Kingdom". Top-ten-10.com. Retrieved 15 June 2013. ^ "NAAONB Website". Aonb.org.uk. Retrieved 15 June 2013. 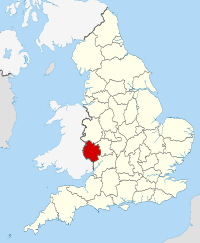 ^ "Herefordshire, County of, in the 2011 Census". UK Census Data. Retrieved 23 December 2018. ^ "Microsoft Word — Regional GVA Article.doc" (PDF). Archived from the original (PDF) on 1 December 2007. Retrieved 25 September 2010. ^ "Herefordshire". The Independent. London. 15 January 2009. ^ "CPC — Press". Polytunnelcontrol.org.uk. Retrieved 25 September 2010. ^ "THE QUEEN ON THE APPLICATION OF WYE VALLEY ACTION ASSOCIATION LIMITED v HEREFORDSHIRE COUNCIL and EC DRUMMOND & SON". EWHC 3428 (Admin),  Env LR 18,  2 All ER 863. BAILII#BAILII. 18 December 2009. Retrieved 24 August 2010. the Council, in my judgment, have made an error of law in relation to their findings that this development was not a project within Schedule 2 and such an error of law, as I set out above, means that quashing of the decision must follow, because the Council have failed to undertake an environmental impact assessment of the process. They failed to go on to consider whether or not the project would have significant environmental effects and, therefore, whether or not it required an environmental statement. In those circumstances, there is no need or purpose for me to consider the subsidiary ground which was raised in relation to the reasons provided with the screening opinion since my conclusions in respect of the first element of the ground of challenge disposes of the case and the planning consent must be quashed. ^ "''The Local Authorities (Armorial Bearings) (No. 2) Order 1997'', www.opsi.gov.uk, accessed October 31, 2007". Opsi.gov.uk. 1 April 1974. Archived from the original on 3 January 2008. Retrieved 25 September 2010. ^ Kirby, Alex (5 May 2004). "''UK counties choose floral emblems'', BBC News online, accessed October 31, 2007". BBC News. Retrieved 25 September 2010. ^ "Herefordshire Council Homepage, accessed October 31, 2007". Herefordshire.gov.uk. Archived from the original on 15 August 2010. Retrieved 25 September 2010. ^ "Hereford United – Potted History 1924–1949". Hereford United F.C. 29 December 2009. Archived from the original on 14 March 2012. Retrieved 25 March 2016. Hereford United Football Club was formed by the amalgamation of two local sides, St Martins and RAOC in June 1924. ^ "Hereford United – Potted History 1970–1990". Hereford United F.C. 29 December 2009. Archived from the original on 29 February 2012. Retrieved 25 March 2016. With the club in a state of decline, a second successive relegation followed and in 1978, United found themselves back where they had started, in the old Fourth Division. ^ "Hereford United – Potted History 1990–2000". Hereford United F.C. 28 December 2009. Archived from the original on 14 March 2012. Retrieved 25 March 2016. Despite United's brave efforts, the match finished all square at 1–1, breaking Hereford hearts and condemning them to relegation from the Football League after a twenty-five year reign. ^ "Hereford United – Potted History 2000–2010". Hereford United F.C. 7 January 2010. Archived from the original on 14 March 2012. Retrieved 25 March 2016. ^ "Hereford FC: New club to play in Midland Football League". BBC Sport. 14 May 2015. ^ "Peter Beadle: Hereford FC manager enjoys double pre-Wembley celebration". BBC Sport. 21 March 2016. Retrieved 25 March 2016. ^ "Midlands to Wales and Gloucestershire route-based strategy evidence report" (PDF). Department for Transport. Highways Agency. April 2014. Retrieved 25 March 2016. The A49 is also used as a strategic route between North and South Wales. ^ "National Transport Plan" (PDF). Welsh Assembly Government. 2009. Archived from the original (PDF) on 15 April 2016. Retrieved 25 March 2016. Rail caters for longer distance travel with the services using the Marches Line, which in part runs through England, taking the majority of passengers. ^ "Welcome to". Railair.com. Retrieved 25 September 2010. ^ "Hereford & Gloucester Canal". Smr.herefordshire.gov.uk. Retrieved 25 September 2010. ^ "Leominster & Stourport Canal". Smr.herefordshire.gov.uk. Retrieved 25 September 2010.